At London, Milan and Paris Fashion Week, there was a sea of logos both on and off the runway. It’s not enough to merely wear a brand any more. You need to shout about wearing it. The fashion insiders have spoken – perhaps it’s a reaction to years and years of the minimalism trend. Maybe it’s the power of social media and our favourite influencers. Or is it the desire to belong in a particular fashion tribe? Whatever the reason, logos are having a major resurgence. Maximalist excess is here. Dive into this 1990’s-style insignia and don’t be afraid to go bold with branding. Get started with logo accessories. Invest in an iconic bag – we’re looking at you, Dior saddle bag. Or experiment with statement logo belts; the styles from Fendi are instantly recognisable and will break up a monochrome look or add further punch to colour block ensembles. Motif T-shirts are the perfect way to get logo-heavy with your daywear. Gucci’s infamous design uplifts a ‘jeans and trainers’ kind of day. Channel a relaxed and youthful vibe with sportswear logos such as Champion and Fila, which are now bona fide fashion staples. Finally, if you’re not one to shy away from the hottest trends then an all-over logo look is for you. 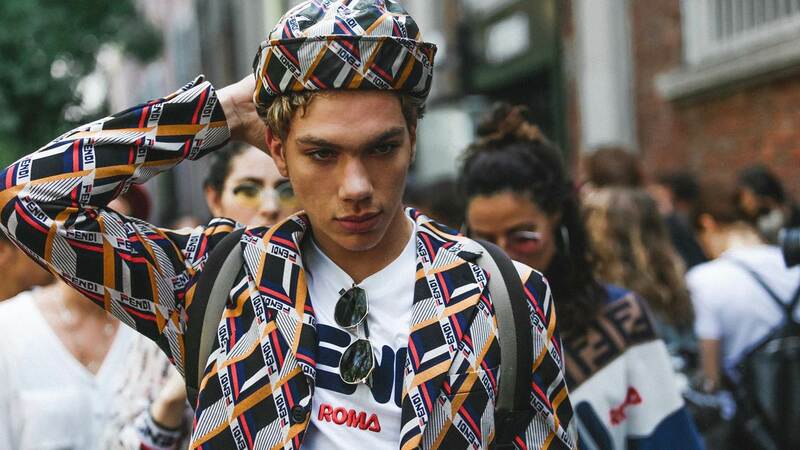 At the Fashion Weeks, we spotted men in head-to-toe Burberry check. Meanwhile, Gigi and Bella Hadid have been rocking modern tailoring with all-over Fendi insignia. Elsewhere, Balenciaga looks are having a moment with the emblem adorning hoodies, tees, footwear and scarves. It’s time to label your look.